It’s been a busy year in our spirits department, with the team traveling the country, tasting through hundreds of distinctive whiskeys, in search of exquisite, one-of-a-kind barrels good enough to bring home and call our own. This ever-changing collection meets our strict standards for taste and quality, and highlights the skill of each distillery we visit. 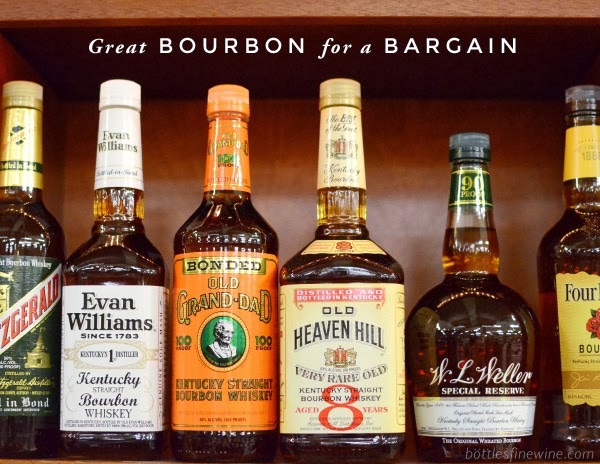 We are very proud to offer these exceptional bourbons, ryes and malts — all available only in small quantities — and only to our loyal, whiskey-loving friends, family and customers. For those new to whiskey, you may be wondering why we put such effort into bringing these bottles to Rhode Island. To understand, it helps first to know what gives whiskies their distinctive flavors. If you’re a seasoned whiskey lover and the process is old hat to you, skip to the bottom for a look at a few of our exclusive barrels. If you’re new to whiskey, read on. Distillers start by making a huge batch of whiskey in one giant vat (we’re talking hundreds of gallons – some, thousands of gallons), using one proprietary recipe. Once distilled, the pure liquid spirit is siphoned off into new charred American oak barrels, which are then set to age for 3 – 10+ years in a rickhouse. (That’s a fancy term for the enormous warehouse lined from floor to roof with barrels at various stages in the aging process.) After years of aging, the contents of those barrels — remember, they contain that one recipe — will vary dramatically in taste. So what accounts for the variations in flavor? It’s all about the aging. It’s all about how long a barrel is aged and where within the rickhouse it matures. And here’s where your 5th grade science comes in: As a barrel of bourbon warms up in the hot Kentucky summer, the wood expands, drawing the whiskey through its inner charred charcoal surface right into the grain. As fall and winter approach, the wood contracts, forcing the whiskey back out, filtered through the charcoal and oak. This process is repeated for a minimum of 3 years, and all the while the whiskey is evaporating, evolving into a more concentrated version of itself. Naturally, barrels higher up in the rickhouse get hotter, evaporating at an accelerated rate, while those on the lower shelves are cooler, allowing evaporation – and the interplay with the wood – to occur at a slower, less intense rate. The sweet spot for aging is on the middle shelves: the barrels that age there are often considered superior. These variations in where a barrel ages and for how long dictate, in large part, its flavor profile. After 3 years (the bare minimum for making what can – or should – legally be called bourbon) a master distiller will start to taste the barrels to see how they are developing, and to start determining which barrels will be married together to achieve the specific flavor profile of each of their various labels. For instance: At Heaven Hill, the bourbons in a bottle of their entry-level Evan Williams Black Label are pulled from all over the rickhouse and blended. Their next-level Evan Williams White Label, is made from bourbon that was aged in barrels for slightly longer, thereby coaxing more refined and nuanced flavors from the wood, and then bottled at 100 proof. These are small variations for sure, however they make a world of difference in the final product. At the other end of the spectrum is the Elijah Craig, which is made from barrels that have been aged only in the middle of the rickhouses. This placement results in a softer, more subtle whiskey, with warm baking spice notes on the finish. The commonality amongst all of the bourbons is the liquid: It’s all the same going into the barrels, but the duration of aging and the location of where the aging is happening is what makes each final bourbon distinct and suited to fit the standard profiles for each different label. However, because this is a wholly-natural process, there are barrels that every once in a while stand out as exceptional. They are barrels that due to patience, luck, and alchemy, are deemed by the distiller to be too unique to be blended into one of their house labels and are therefore set aside. When we travel to Kentucky to buy bourbon, these are the barrels that we taste and bring back to Rhode Island and call our own. These “snowflake” barrels are of extraordinary quality and are unique expressions that will never be replicated. If this process intrigues you, we invite you to pick up an “everyday” bottle of these bourbons along with our selections. Try them next to each other at home, either neat, with a splash of water or a cube or two of ice. See what kinds of differences you can spot. We hope you’ll enjoy our selections as much as we do – just don’t fall in love. Once they’re going, they’re gone forever! We selected this amazing barrel out of the 2 million aging in the Jim Beam rickhouses during a trip earlier this year. Among the samples we tried, there were two barrels that had aged right next to each other for the same amount of time. Despite their proximity, these siblings were as different as you are from your brother or sister. The barrel we chose in the end is a pristine example of the caramel and oak notes you get from the finest bourbons. Flavor Profile: Hot and uncompromising. We don’t know if you can handle this bourbon. It’s like getting socked in the mouth with a nerf ball steeped in bourbon, caramel, dried fruit and more bourbon. In making this selection we were looking for a bourbon with the classic Old Forester expression: caramel on the verge of burning with just a hint of baking spice on the finish, along with those difficult-to-put-your-finger-on nuances that come with bourbons that have aged longer. After tasting through 3 excellent samples, we chose this single barrel, realizing it hit the nail on the head! Flavor Profile: Direct and stalwart. A little dark caramel, a little chocolate, a little roasted fruit, a little dusty oak, a little toffee. A little bit of everything in this well-balanced bourbon. We selected this barrel in Rhode Island back in March, based on samples that distiller Heaven Hill sent. Then, in a moment of bourbon kismet during our trip to the Heaven Hill distillery in Kentucky a month later, we stumbled upon – among the 1.5 million then aging at Heaven Hill – the very barrel we had selected in March! Against staggering odds. But there it was, sitting on the bottling floor, just waiting to be emptied. Unlike the core expression of Elijah Craig Small Batch, the juice from this barrel has a more pronounced oakiness, and less clove on the finish. We prefer it to the “everyday” Elijah, and at this price, it won’t last long! Flavor Profile: Savory & satisfying. Like a warm cherry pie where the crust is just a little dark in places. Tune in next week for a dive into our remaining collection. In the meantime, our entire Private Barrel collection is available at our sister bar, The East End . Stop in for a taste and let us know what you think! This entry was posted in Learn About Spirits and tagged barrel, barrels, bottles, bourbon, elijah craig, knob, private, whiskey on September 21, 2017 by bottlesfinewine. If you haven’t yet moseyed on over to see Trinity Repertory Company’s widely-praised production of Rodgers & Hammerstein’s “Oklahoma!”, do it now. Mosey now. And while you’re there, sip on “The Farmer and the Cowman,” a cocktail we created with Curt Columbus, Trinity’s Richard L. Bready Artistic Director, to pair with this quintessentially American show. Fill a tall glass with ice, add 1.5 oz Bulleit Bourbon and 5-8 dashes Fee Brother’s Rhubarb Bitters. Top with soda water and garnish with a wagon wheel of lemon. And If bourbon’s not your thing, try one of “Curt’s Picks.” They’re the bottles that Curt – a true wine lover with an experienced (and wonderful) palate – chose to pair with the show. Enjoy the show – and if you enjoy the wine – visit Bottles, as 20% of each bottle purchased in store will be donated back to Trinity Rep through the duration of the production. This entry was posted in Bottles for the Cause, Cocktails, Learn About Spirits, Learn About Wine and tagged bourbon, bulleit, charles & charles, cocktails, Cowboy, farmer, line 39, oklahoma, trinity rep, trinity repertory on May 18, 2016 by bottlesfinewine. We scoured the wide world of beverages to select the perfect gifts for wine, beer and cocktail enthusiasts this year. They’re the bottles that are in-demand, on-trend, highly-acclaimed, and flat-out awesome. Available only at Bottles: our private barrel (hand-selected by us!) of this highly sought-after bourbon: extremely rich & uncut – ideal for the hard-to-shop-for bourbon lover. Limited quantities availability. First released earlier this year, this genever-style gin distilled from beer brewed with traditional gin botanicals is for beer and gin lovers alike. Locavores, will love it, too – it’s made in RI. Delicious esoterica for the beer geek: award-winning Imperial Stout (various flavors) aged in oak bourbon barrels. The color of the wax enclosure indicates which bourbon casks were used. The gift for serious collectors: 2010 is widely regarded as the most outstanding vintage for Barolo in the past several decades. Choose from our selection of acclaimed producers of this iconic wine. Hand-crafted, all-natural almond & hazelnut creme liqueur for the serious at-home bartender and after-dinner drink aficionado. It’s what we want this year. Limited quantities available. Wildly popular with the country’s most talented mixologists, this regional mezcal is made with wild-harvested sotol rather than the standard agave. A must-have for the tequila / cocktail enthusiast. The limited-edition, V.E.P bottling of this classic, secret-recipe liqueur is given special treatment with long aging in oak barrels. Each bottle is hand numbered and encased in a collectable wooden box. A truly special gift. They’re what sommeliers across the country are buzzing about: wines from this volcanic region are the most interesting being produced in Italy today. An outstanding gift for all wine enthusiasts. One of the world’s most iconic wines is at the top of the bucket-list for many an oenophile. The pricing on the critically-acclaimed 1999 vintage makes this a splurge-worthy gift-of-a-lifetime. Don’t miss out. Five tiny bottles of booze all in one mystery box – who knows what they’ll get? One of our most popular gifts year after year. Makes a fun stocking stuffer or contribution to the Yankee Swap. AND, for true one-stop-shopping, ask a team member about our various, festive wrapping & gift card options. This entry was posted in Cocktails, Gift Ideas, Other and tagged barolo, beer, bottles, bourbon, box of nips, chartreuse, cocktails, creme de noyaux, d'Yquem, gift guide, gifts, gin, ideas, mt etna, nips, sauternes, sicilian wine, sotol, stout, tempus fugit spirits, wine on December 1, 2015 by bottlesfinewine. For me nothing says holiday festivities quite like a big ol’ batch of punch! Many fine parties have begun around a punch bowl. By serving punch, you’ll not only satisfy your unquenchable guests but also save yourself the crazy expense of trying to have a full bar at your shindig. Even better yet, you can prepare most of these ahead of time! Mixing everything except the bubbly components (if your recipe calls for it!) allows the flavors to marry together. And that makes for some mighty fine punch! Fun, easy, and bubbly! This is a great budget friendly punch that will still have a major wow factor among your guests, and is full of classic holiday flavors. Using a Bundt or tube pan, place pear and apple slices in a circle on the bottom of the container. Slowly add water to submerge the fruit & freeze. Ice ring can be made 1 week ahead. Stir Calvados, St. Germain, bitters, and 1 cup of water in a punch bowl. Add ice ring (let the mold sit at room temperature for a few minutes to loosen), then sparkling wine. Ladle punch in glasses and grate nutmeg over each glass. Serves 16. Near and dear to my heart, the Old Gunwhale is a personal favorite of mine. I have made this punch time and time again, each time with a wonderful reception from guests. Despite how simple it may seem, I find that the sum is definitely greater than its parts! In a saucepan, place the sugar, water, and the chamomile tea bags or dried chamomile tied in a piece of cheesecloth. Bring the mixture to a boil, let it cook for a few minutes, then remove from heat to cool to room temperature. Combine the chamomile syrup, bourbon, grapefruit juice, and bitters in your serving bowl. Add ice cubes. To serve, ladle into a glass filled with ice. Serves 10. This is my wildcard recommendation! In the mood to throw all caution to the wind? Then this gem of a punch recipe may be overkill as far as ingredients go, but if you are looking for a wildly delicious punch, then look no further! Combine red wine, rye, brandy, vermouth and Carpano in a pitcher. Slowly stir in the sugar until dissolved. Refrigerate for a few hours until cold. When serving, place ice block in punch bowl and pour chilled mixture over. Top with moscato and sparkling water and serve. Garnish each glass with an orange twist. Makes 25 servings. A note on serving vessels: Don’t have a Baccarat crystal punch bowl? Kidding, fret not my dearies! Honestly, if you have a punch bowl by all means utilize it! However for the rest of us, I have to say that a stock pot works darn well in a pinch. This entry was posted in Cocktails, Party Ideas and tagged bourbon, holidays, party, punch, recipes, wine on December 16, 2014 by bottlesfinewine.